Learn from the mistakes of others, because you can't live long enough to make them all yourself -- Ralph Waldo Emerson, quoted in "Better by Mistake"
My cognitive dissonance meter swung past the peg as I read Alina Tugend's fascinating exploration of learning from mistakes, the culture of apologies and similar aspects of admitting that you screwed up "Better By Mistake: The Unexpected Benefits of Being Wrong" (Riverhead Books, a member of Penguin Group USA, notes, bibliography, index, 304 pages, $25.95). She explains her premise in the conclusion and, since this is a review of a nonfiction book, not a novel, I'm not violating the spoiler rule by stating it: "It explores the tension between the fact we're taught when young that we learn from mistakes, but the reality is that most of us hate and dread them." The phrase "I screwed up" was used by President Barack Obama when he was forced to withdraw the appointment of former Sen. Tom Daschle for Secretary of Health and Human Services when it was learned that Daschle had one of those pesky tax problems that crop up so often inside the Beltway. Tugend says Obama was right to fess up and avoid the passive voice -- "mistakes were made" -- in his mea culpa. Cognitive dissonance comes in for examination (Pages 197-199) by Tugend: It's when we have two ideas, beliefs, or opinions that are at odds with each other -- and she cites a particularly good example: "Smoking is a dumb thing to do because it could kill me" combined with "I smoke two packs a day." By reducing dissonance, we resist admitting that we made a mistake, especially one that could be a teachable moment, because she says we "all want to have a positive self-image as good, moral people." Tugend is a New York Times columnist who writes that she was motivated to write the book after she made a mistake in a column: "My first instinct, when the minor error was pointed out, was to disown it or cover it up." (I can understand that feeling as a journalist since 1966, on five daily newspapers, including more than 14 years at the Los Angeles Times and now as an online content provider). Tugend continues: "To rationalize that a correction was not really needed. Then I did what a good journalist should do and told my editor. She graciously acknowledged that she should have caught the error, and we submitted a correction, which ran a few days later." End of story? No, the beginning of a book, because Tugend was bothered "not so much the mistake, but the fact that in the world today -- in our personal lives, our social interactions, and our workplaces -- mistakes are viewed as 'bad.'" 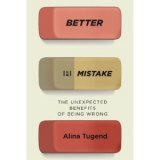 In her very readable book -- which draws on both real-life mistakes and academic studies and news events --Tugend shows how embracing mistakes can make us smarter, healthier and happier in every facet of our lives. She examines the tension between what we're told from our earliest years -- that we have to make mistakes in order to learn -- and the reality: that we often get punished for making mistakes and therefore try to avoid them or cover them up by, for instance, inventing hikes on the Appalachian Trail when we're down in Buenos Aires romancing our mistress. Tugend shows that mistakes are everywhere: who would think that the square corners on the windows of the DeHavilland Comet, the world's first commercial jetliner, would cause metal fatigue and cause the sleek and British jetliners to crash and burn in the 1950s. She uses this example (Page 101) along with an entire chapter (Chapter 5: Lessons from the Cockpit) involving aviation, because mistakes in airplane design and flying in general are far more dangerous than a mistake in a newspaper column. She compares and contrasts the way two companies, the makers of Tylenol and Toyota, handled fatal problems involving their products. Tylenol laced with cyanide caused several deaths in 1982. The manufacturers, Johnson & Johnson, acted proactively, which was in contrast to Toyota's handling of the sudden acceleration and braking problems. Led by its chairman of the board, James Burke, Johnson & Johnson didn't try to shed responsibility, didn't try to cover up and didn't try to minimize the danger. The Tylenol incident goes down in the books as the right way to handle a crisis, unlike Toyota's handling of alleged defects, which Tugend says will "more likely end up as case study of the wrong way to do it." Tugend deals with the failure of Wall Street that led to our financial meltdown in 2007 and 2008, mistakes that so far have only resulted in multimillion dollar rewards to the the culprits in charge, the Angelo Mozilos of Countrywide Financial, the Stan O'Neals of Merrill Lynch, the Chuck Princes of Citigroup and all the others. On Pages 95-96, she explains the workings of The Talent Myth, which owes its name to an article by the ever present and always quotable Malcolm Gladwell in the New Yorker. Gladwell, according to Tugend, says there are many reasons for the successes and failures of any corporation, but he (Gladwell) compares the excessive focus of Houston-based Enron on MBAs from good schools and another Texas corporation, Dallas-based Southwest Airlines, which hires very few MBAs and is "vastly more successful and effective than its low-cost competitors and is still around, while Enron is gone." So, overcome your tendencies toward cognitive dissonance and absorb the lessons Alina Tugend presents in "Better By Mistake." And, whether you're writing a book review or a school paper, check your facts and your spelling, but take a mistake or two in stride. Alina Tugend lives outside New York City with her husband and two sons. She has a bachelor's degree from UC-Berkeley and a master of studies in law from Yale Law School. She's a veteran journalist, having written about education and environmentalism and consumer culture for many publications, including the New York Times, the Los Angeles Times, the Atlantic and Parents. Since 2005 she has written the biweekly consumer column "Shortcuts" for the New York Times business section. Her website is: www.alinatugend.com.